Timing is everything - and that's especially the case when it comes to music. Whether it's releasing a song at just the right time to connect with as many people as possible or choosing the right order in which to release singles from an album, decisions to do with timing can make or break careers. 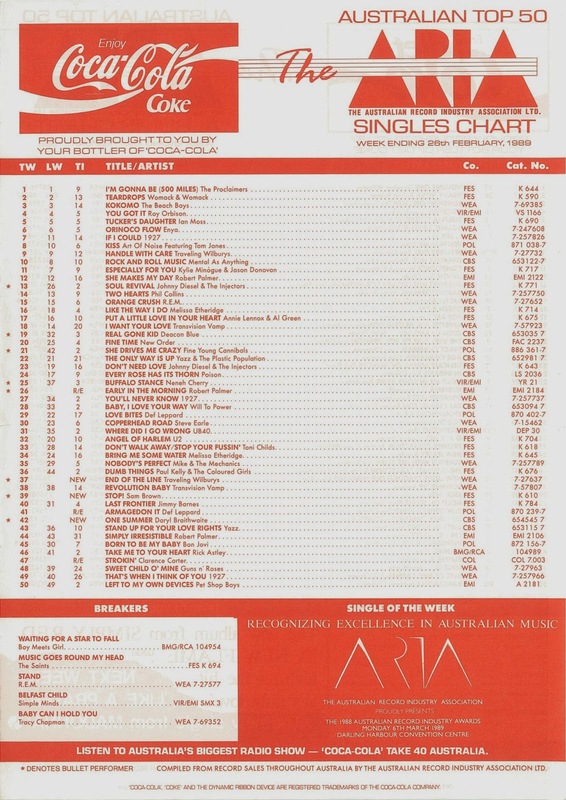 The three new entries on the ARIA chart this week in 1989 all had timing on their side for one reason or another (in a couple of cases, only just) and all went on to become big hits in Australia. The biggest hit of all in the country was still by The Proclaimers. I have nothing else to say on that particular topic. Before we get to our new entries, here's another single by Tracy that failed to make it into the Australian top 50 but has, over the years, become an incredibly well-known song. In the UK, part of the song's fame is due to Boyzone's 1997 remake, which peaked at number 2 there. That cover wasn't a hit here, but enough Australians would have become familiar with one version or the other over the years thanks to album sales and radio play. Another act that was having trouble landing a second top 50 hit was R.E.M. - and that's despite the fact that this follow-up to "Orange Crush" was easily the poppiest thing they'd released to date. In fact, this song sounds so much like a hit single that, when I first looked at the breakers on the chart this week, I seemed to remember "Stand" being successful in Australia. But no, it would take until 1991 for the band to return to the top 50. It was a different story in the US, with "Stand" giving R.E.M. their second top 10 hit. Hitting the chart in the final week of summer is Daryl's ode to the sunny season. In many ways, this would have been a better second single from Edge than "All I Do" (the relative flop between two much bigger singles). For one thing, "One Summer" is a far superior song; for another, it would've come out instead at the start of summer and been blasted all season long. There is one way in which the timing of "One Summer" was actually quite smart. By hitting the chart in the dying days of the season, it reminded people of the summer months just past - and nostalgia's never been a bad thing when it comes to music. 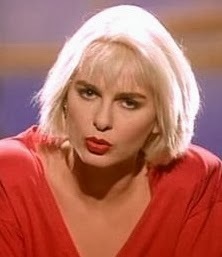 February 1989 was a great month for Sam Brown - with the timing finally right for "Stop!" to climb to a peak of number 4 in both Australia and the UK. The song had originally been released in mid-1988 in the UK, but it stiffed at number 52, while in Australia, it started its chart life back in October '88, bouncing around the lower end of the top 100 for a few weeks. In both countries, the impassioned ballad re-entered the chart in February and rocketed into the top 5. Far and away the biggest hit by the husky-voiced British singer (whose parents were both recording artists), "Stop!" was later covered (without the exclamation mark) by Jamelia for the soundtrack to Bridget Jones: The Edge Of Reason. Like Roy Orbison's Mysterious Girl album (from which lead single "You Got It" was sitting at number 4 this week in 1989), the Traveling Wilburys project was completed just in the nick of time, since the Big O passed away in late 1988. The clip for this second single was filmed after Roy's death, with an empty rocking chair set aside to represent the gap left by the music legend. Next week: the original version of a song made even more famous when it was covered by a Spice Girl a decade later and an obscure song from 1980 made more famous by rock's latest blonde bombshell. Before that, I'll conclude my top 100 for 2001, the first two parts of which you can catch up on here (Part 1) and here (Part 2). I don't remember hearing the Tracy Chapman song (or the Boyzone version) before. I remember that Rage and Video Hits both aired a 'live' version (from the Belgian 'Diamond Awards' - the same event as where the Roy Orbison 'You Got It' 'video' was filmed) of 'Stop!' while it was in the charts, instead of the proper video. I used to always laugh at the Sam Brown live clip when they flashed to that girl in the audience singing her heart out. R.E.M. amended. Don't know what I was thinking. I always thought too that Daryl should have released "One Summer" as the second single during the summer months of '88/'89. Perhaps he should have planned the recording and release better and called it "This Summer"???. But yes, nostalgia worked a treat. Daryl's comeback was one of the greatest Australian success stories after John Farnham. Even though, I didn't know this guys history in Sherbet and just saw him as a new solo artist. I guess that's what happens with each generation. I recall the proper video for "Stop" being shown on Video Hits in April '89. I remember tuning my stereo into Ch.10 and recording this video/song onto cassette. On the "1989 Be Happy" & "Hits Of '89 Volume 2" video compilations, there is the concert version and the actual video on the other. "Stand" is a very catchy pop song, can't believe it wasn't a 'hit' here, esp. since Australia was inundated with catchy pop songs by SAW during '88 & '89. I don't recall ever seeing the 'Stand' video on TV at the time, which might have had something to do with its lack of success. I discovered it in the mid 00's on an old VHS tape, as a random video that aired after the Rage B-52's special in 1992. I remember thinking, "Wow, I haven't seen this before and didn't even know that I had it." I remember hearing it a few times though on American Top 40.